Hello my scrappy friends and welcome to my blog today! 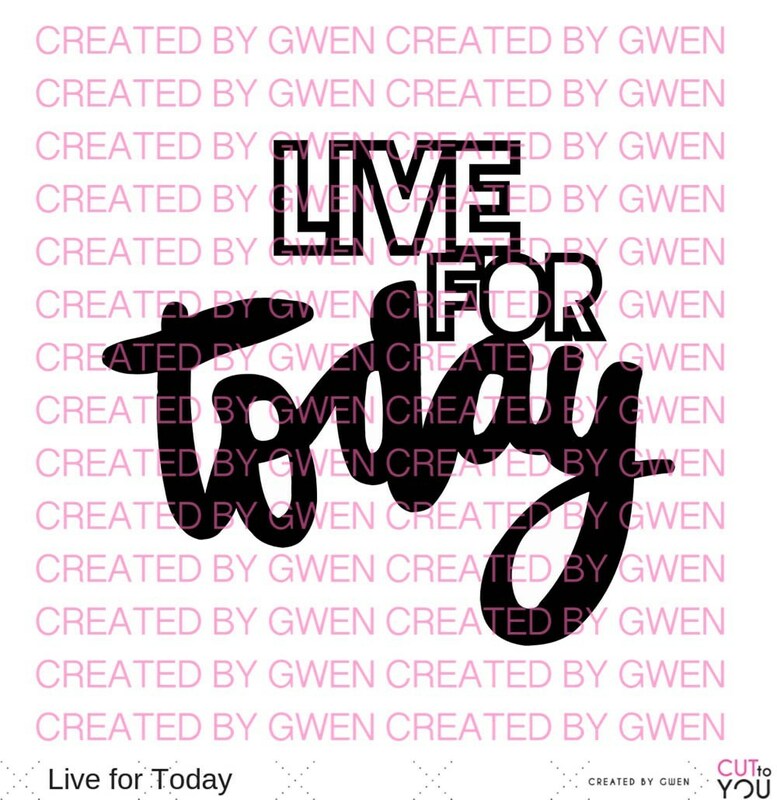 Today I have another share for CUT to YOU and for this page I have used an older cut file called Live For Today. 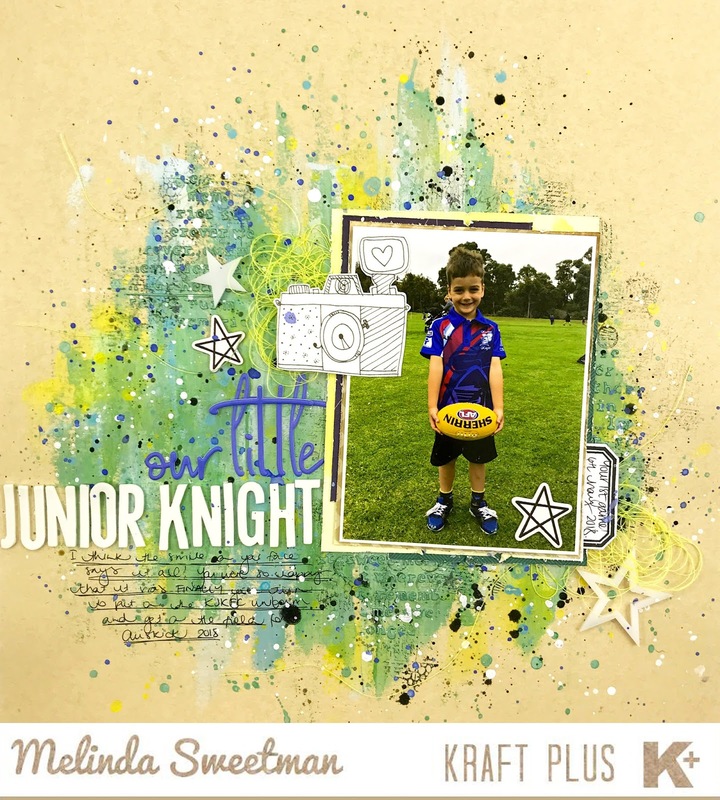 I cut this in black card a while ago and thought it was perfect for these photo's of my biggest child. First up I backed the open letters of my title using some patterned paper I had picked out to work with the colours in my photos. I worked out where the photos and title were going to be placed and added some white gesso to my back ground paper, smudging the edges with my finger for a softer finish. I also added a small amount to the top left of the page. I've used the packaging technique and a paint brush to add colour onto the gesso'ed back ground paper with some mists and paints from my stash. You can see how that all came together in my process video, linked below! 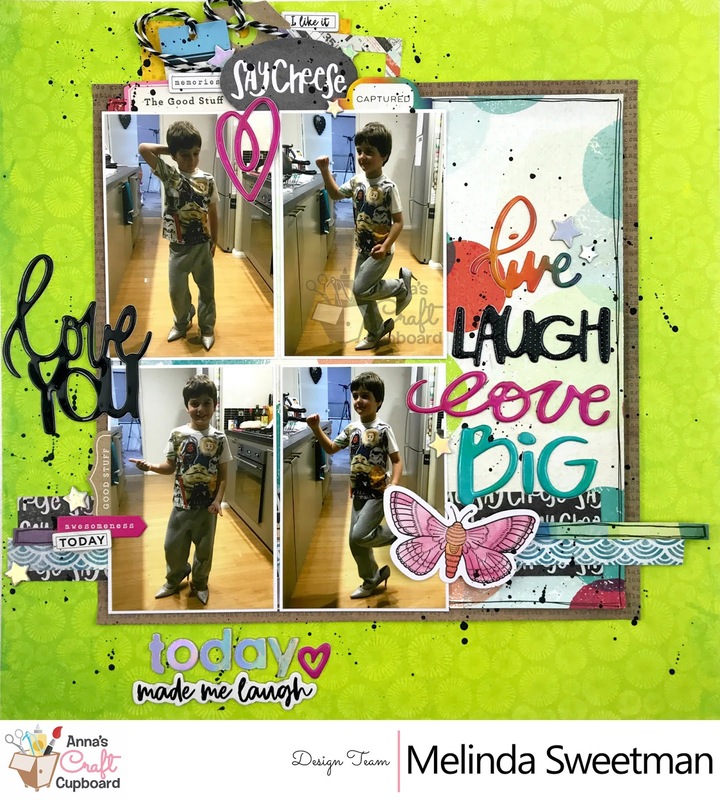 I hope you have enjoyed my share today, I love these photo's of my little goof ball and I love the finished page! Hey everyone and welcome back for my second share for April! 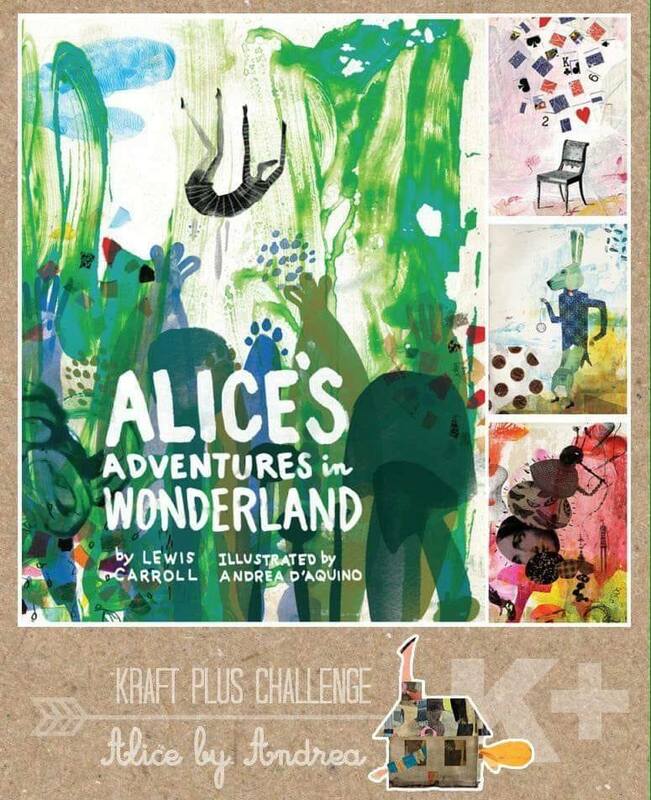 This one is my take on this month's fun challenge for Kraft Plus Challenges. This page was SUPER fun for me to put together! I didn't really have much of a plan which left me lots of room to just play! And get messy!! I was inspired by the main image in the inspiration piece - the colours (the green with the pops of black and yellow and the bold white lettering), the messy smeared on look of the paint and really artsy feel to the whole thing. I've used 3 colours of Novu Embellishment Mousse - Aloe Vera, Coastal Surf and Powder Blue and literally smeared them onto the page. For my yellow I have used some Colour Blast Colour Paste. For even more DT inspiration head over here and check out what the other talented DT members have done with this fun prompt! 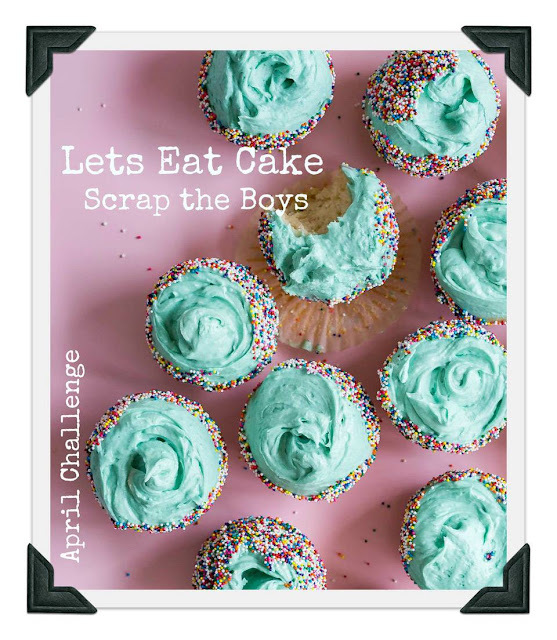 That link is also the one you'll need to upload your take on this challenge so make sure you know where to go! I do hope you enjoy and I'll be back again soon with another share! Hey everyone and happy April! I really love this half and half page I created! I wasn't sure where I was going when I started this design but truly love the end result! Our sponsor this month is the A-MAZING Cocoa Vanilla Studio so I have dug into my CVS stash again and pulled mostly from the Wish Big collection. 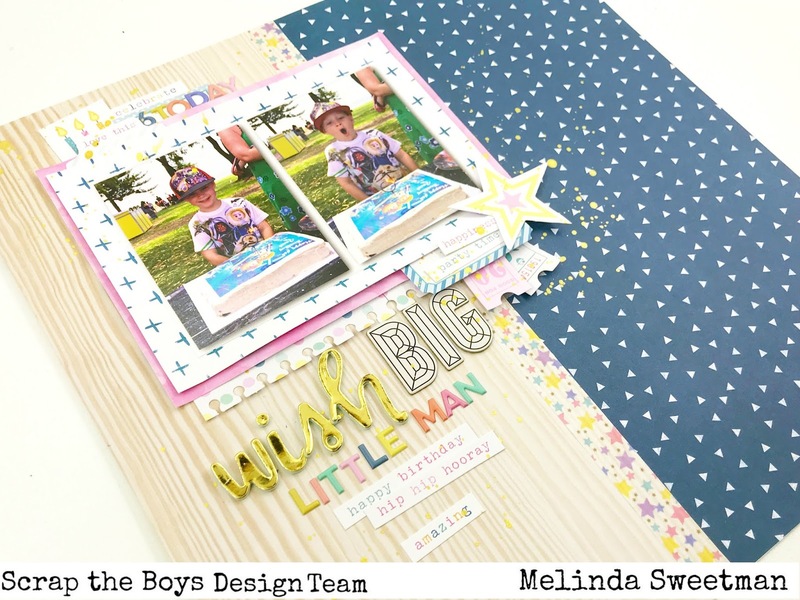 The right hand back ground paper though is from the Boys Rule collection and I love the boldness of it! 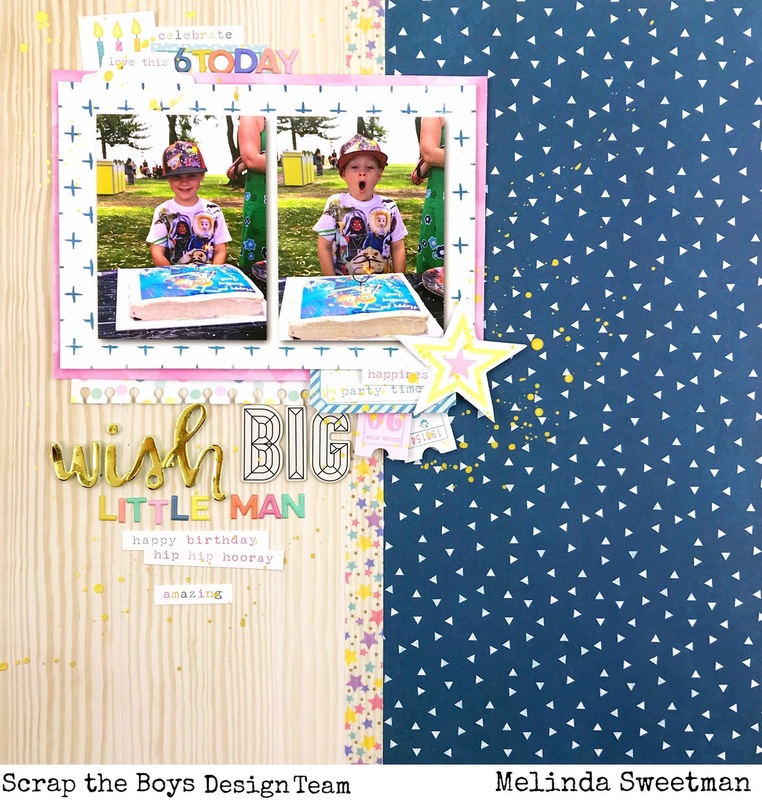 As you can see I have created a mixed media background without a cut file in sight!! But wait!! The cross stitch heart pattern in the background is indeed a cut file! It's the Stitch Geo Heart cut file and I cut this on some paper that I won't use and then using some modelling paste used it as a stencil! I did leave it over night to dry thoroughly as I knew I was going to add lots of water. I've used my (brand new ;) ) Distress Oxide sprays to add colour to the heart. I've simply sprayed a little colour, spritzed some water and between tipping my page and using a paint brush got the colour moving all over the heart and defining the heart shape. The colours I have used are Cracked Pistachio, Mermaid Lagoon and Faded Jeans. I've used a wet paint brush with clean water around the shape of the heart to fade out the colours. I didn't want to cover up too much of the heart so I have used a pattern paper behind the square photo and then some white tissue paper behind both photos and stuck them together. 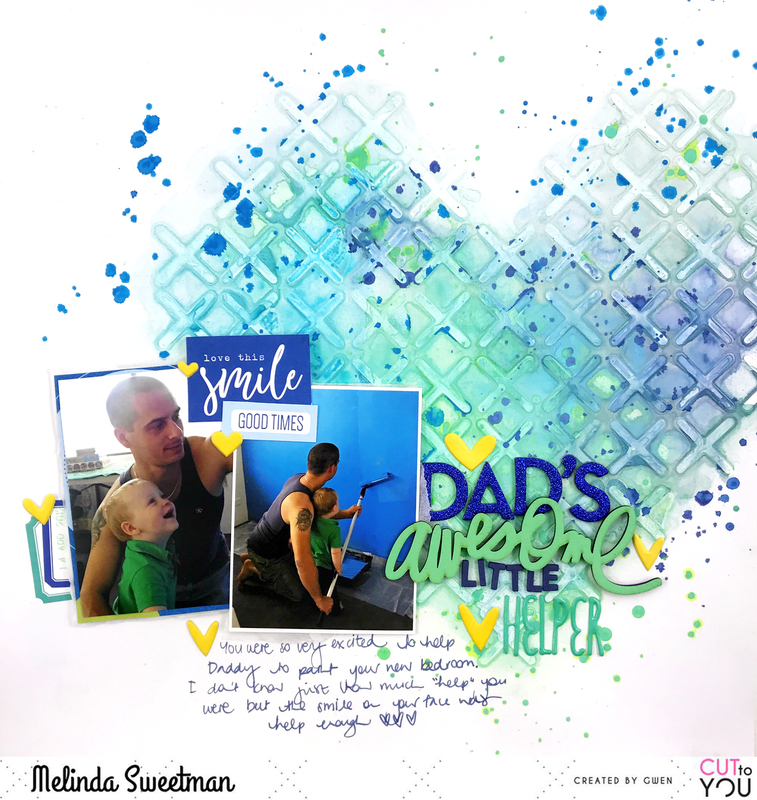 It was always obvious to me that the title of this page HAD to be "Dad's Little Helper" so with that in mind I picked out some lettering and in the process found that "awesome" wood veneer painted in the perfect colour to go onto this page so added to my title coming up with "Dad's Awesome Little Helper" - all the alphas are from my stash and all except the tiny foam ones are old! I added in a couple of cut apart pieces from Elle's Studio and then finished off the page with some yellow puffy hearts. I love the contrast of the yellow against all of those blues and greens! My "stencil" is still good for another use or even 2 as I only used it to apply some modelling paste and didn't leave too much on the paper so you very may well see this same pattern pop up soon! Thanks so much for stopping by and I'll be back again soon with another share! Hey, hey my scrappy friends! 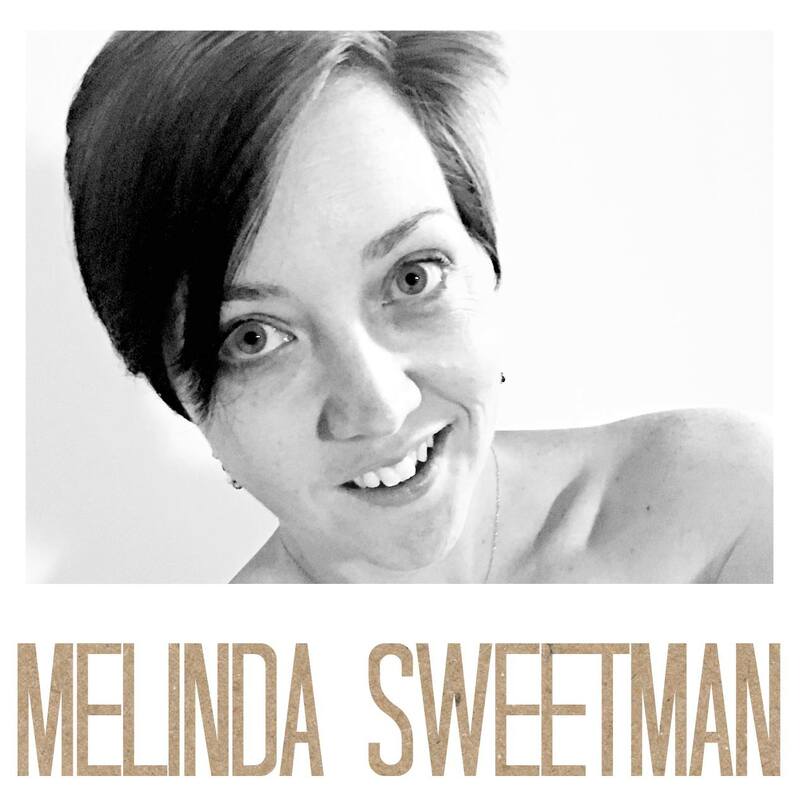 Welcome to my blog today! 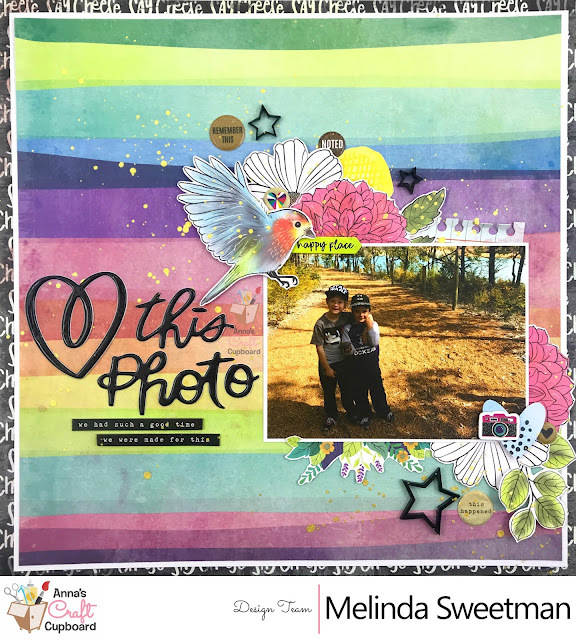 If you follow me on any other social media platform you will have seen that this week I have been up on the Anna's blog sharing the creations I have made with the brand new, awesomely fun Vicki Boutin collection called Color Kaleidoscope. I thought I would pop together a blog post of all of the pages with links to all of the official Anna's blog posts and my YT videos so I hope you enjoy! 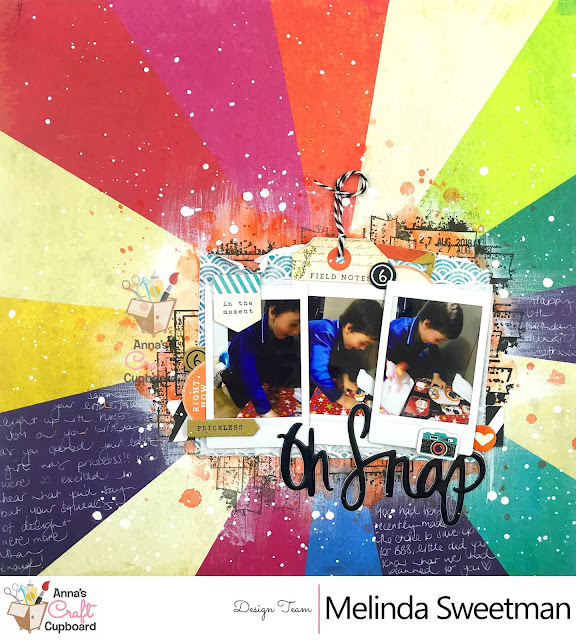 First up last Thursday I was on the blog with this rainbow number! My next share on Friday was another rainbow number lol I also really love the way this one came together! 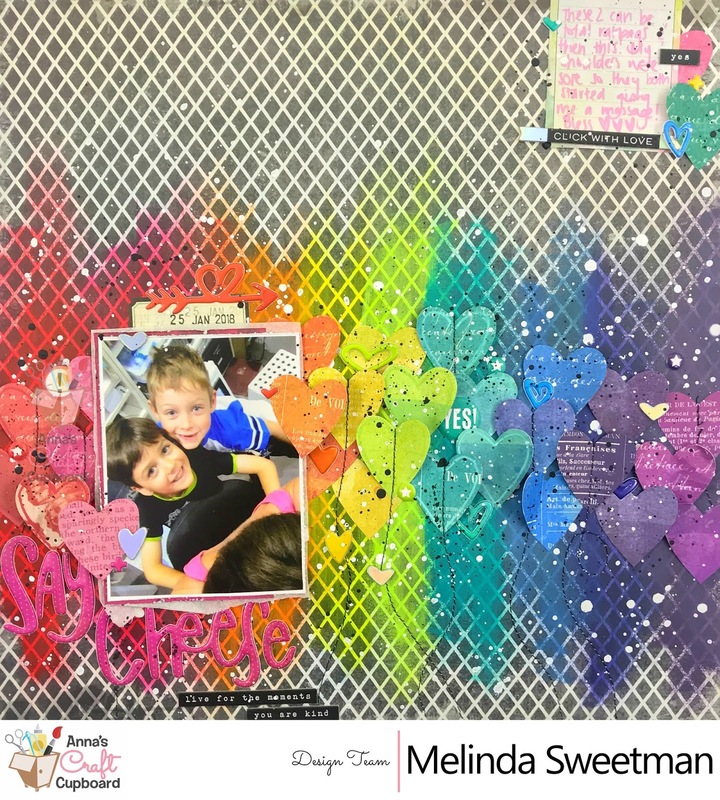 I especially love all the dimension from those hearts! Next up was ANOTHER rainbow layout! I just couldn't help myself! And funnily enough, I didn't realise until I photographed these pages that they were all rainbow pages!! My next page is kind of a bit different for me! It's one page of a 2 pager! While not a traditional double page layout it is the first of 2 companion pages. I have done this this way as there were too many photos (for me) for one page. And number 2 of 2! Blog post is here and, of course, You Tube process video is below!! And here are the 2 pages together for you! 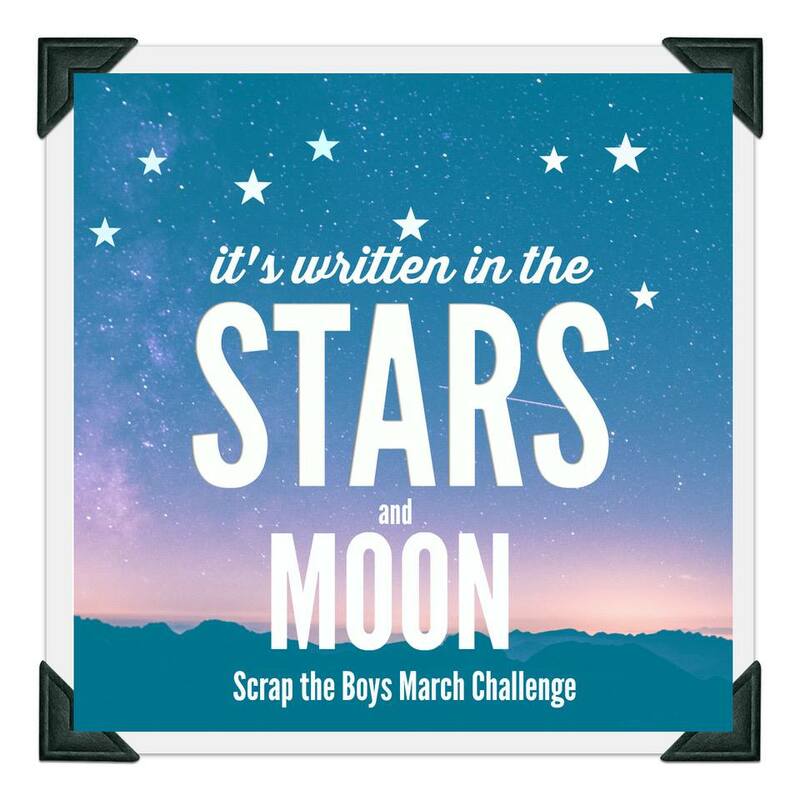 I am going to share this photo (above) in the Anna's Craft Cupboard FB Community Page to start a little discussion so if you would like to join in head over and hit that join button! There may also be "member only fun things" that happen over there so if you don't want to miss out, head on over! I do have one more page to create with this collection (and will still have left overs!!!) but I'm not 100% sure when that will happen so I will create a new post just for the page! I hope you have enjoyed my shares this week using the Vicki Boutin Color Kaleidoscope collection, I sure have had fun creating with it!! 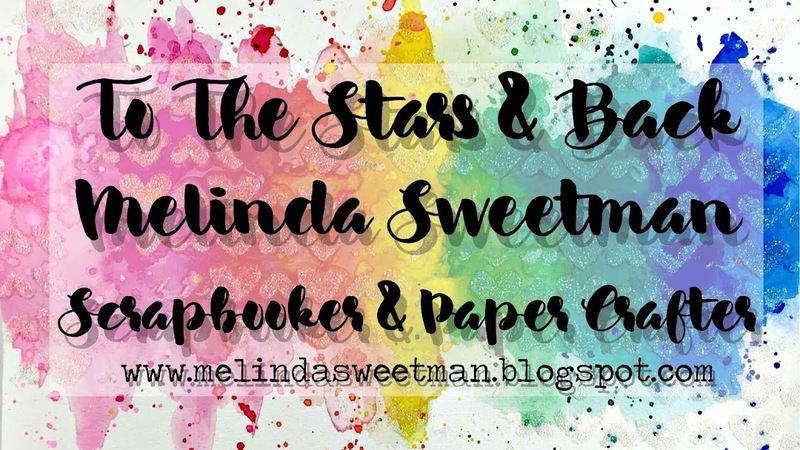 Hello my scrappy friends, it's so lovely to have you here on my blog today!! 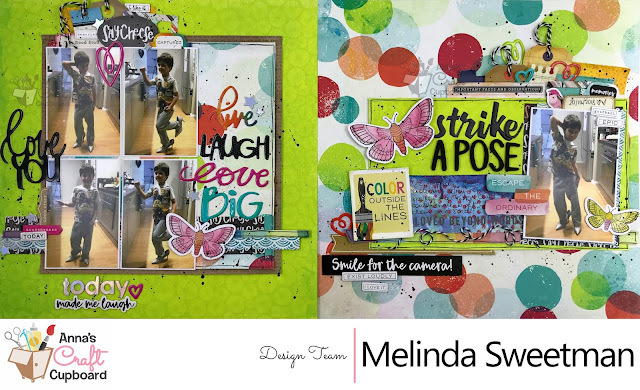 Today's share is for CUT to YOU and I love the simplicity of my page that really lets my cut file of choice shine! I have used an "older" cut from November called Title Bouquet. As soon as I saw this file I knew I wanted to make it BIG and fill that middle area with a kind of panoramic picture. I created a smaller cluster to the bottom right of the page including the rest of my title and some scraps of paper from the same collection I cut my cut file from. I've added in some stitching to the bottom cluster as well. I finished out my page scattering some enamel dots all around the page. 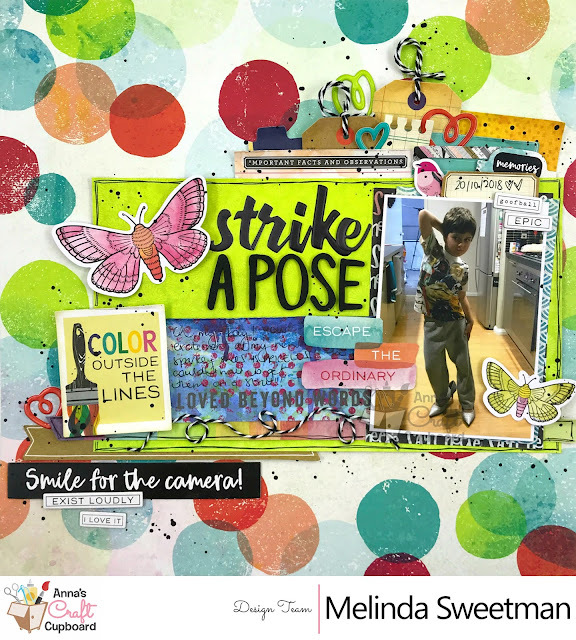 I have created a process video for you today and it includes the process I followed in Silhouette Studio to get my file cut and how I "designed" my page as well before I cut anything! 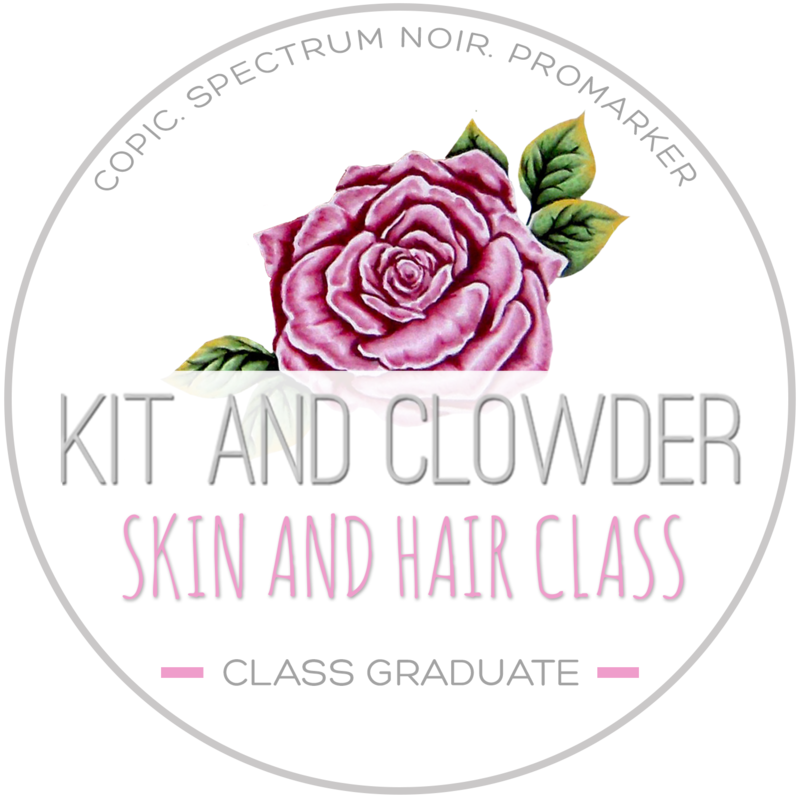 I'd love for you to check it out! I hope you have enjoyed this page and I will be back again soon with yet another share!! Hey everyone!! 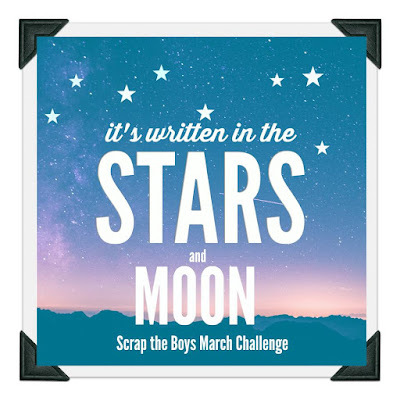 A new month and another new challenge for Scrap The Boys! 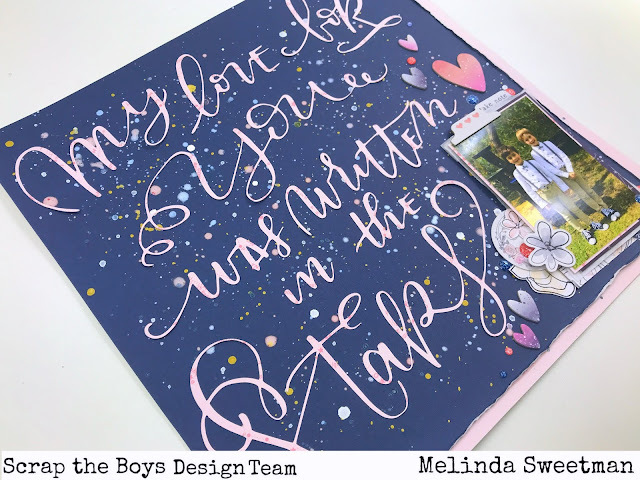 This month we have a beautiful inspiration board to play along with and I was inspired by both the quote and the colours (one of my all time fave colour combos - navy and light pink) and decided to go big with my title. 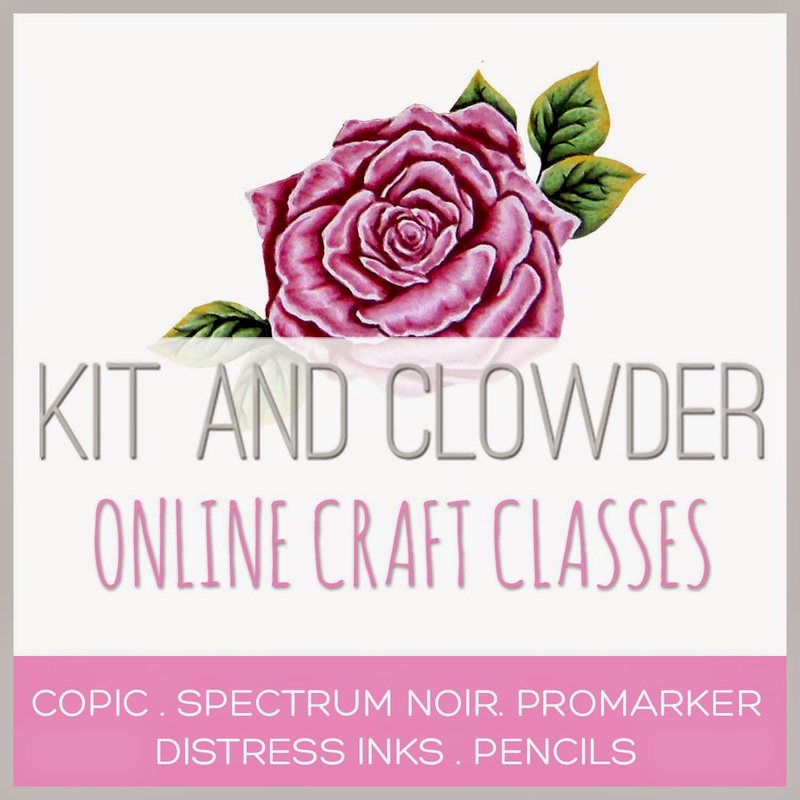 This month our sponsor is Cocoa Vanilla Studios and though I have a substantial CVS stash I didn't have just the "right" colours to use for my background or cut file so pulled from my stash. 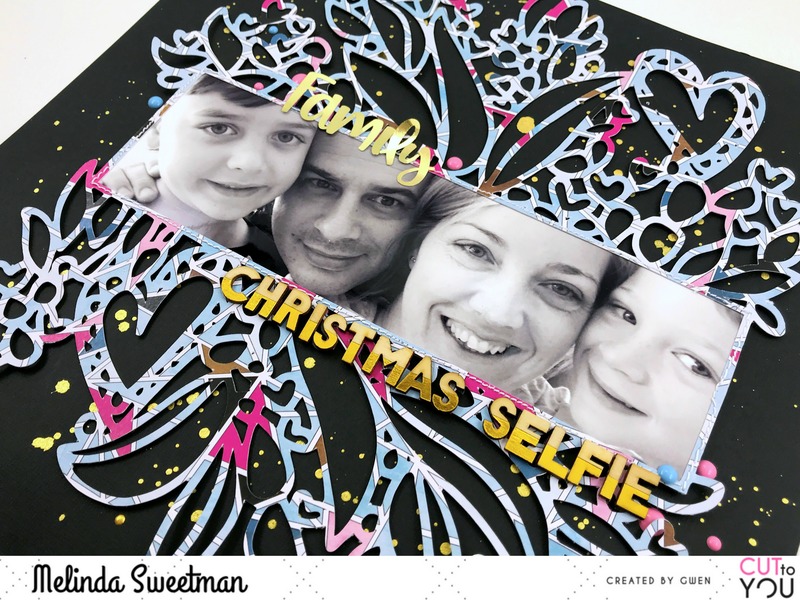 The cut file I used is from the Silhouette Studio Store and the file number is 111217. I have cut it on an older Dear Lizzy paper and made it fairly big. I also used the same paper to back the right hand side and the bottom of my card stock background. 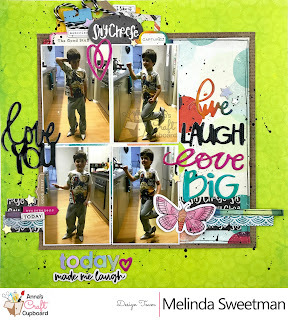 I added some splatters on my background, behind where my cut file would be, using some of my Shimmerz Paints products. A couple of layers of scrap papers from my stash behind my photo of my boys and also some tissue paper. I pulled out my stash of CVS Midnight embellishments and layered those around the page and under/around my photo. 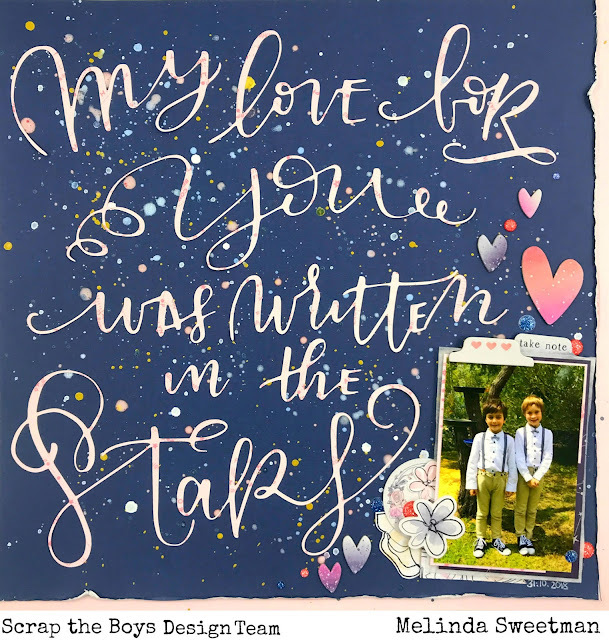 My final step was some enamel dots from CVS also sprinkled around where my photo and embellishments were. 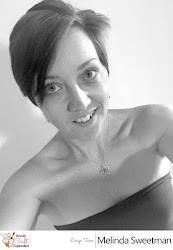 Something different for me, no journalling!! I felt that the title said all that I wanted to say. I may go back in and add the details of the where we were and the why they were dressed up but I do have other photos of this same event (wedding) which I will scrap and tell those details. I do have a process video for this and will link it up as soon as it's edited and uploaded. I am currently away on scrap retreat for the long weekend (here in WA) and won't be able to finish off my video until probably Tuesday. 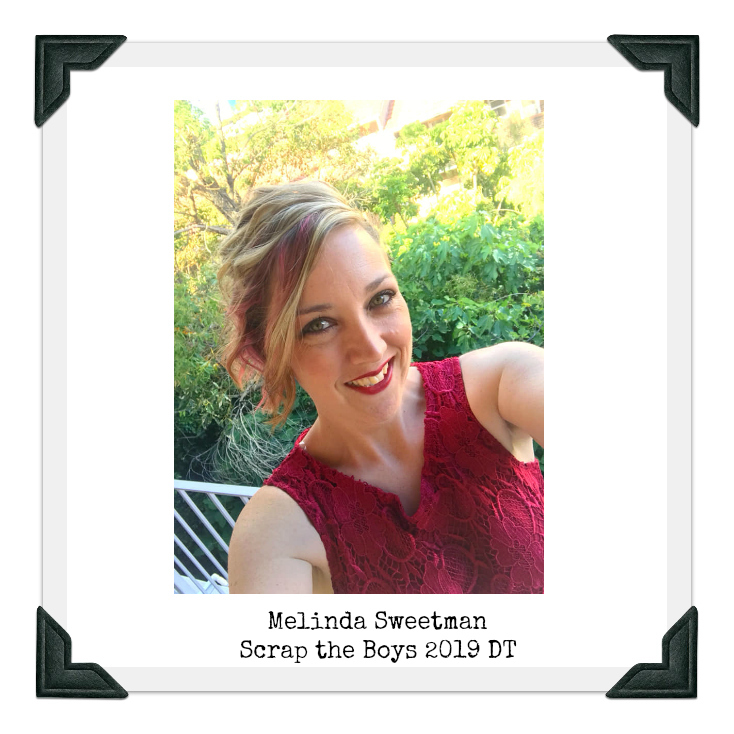 I hope that you find some inspiration from myself and the other DT members over on the STB blog here and do remember to link up to the blog post! Thanks so much for stopping by and I'll be back again with another page to share with you all!